Why are Brazilians still using Boleto for online purchases? Why are Brazilians still using and preferring Boleto Bancário for online purchases? We conducted a survey in July 2017 across all of Brazil's five regions with Brazilians that pay for online purchases using the Boleto Bancário, a very traditional Brazilian cash payment method. The main purpose of the survey was to find out why these online consumers choose to use this particular cash payment method, besides crossing this information with data about their profile. The results offer a better understanding on why Brazilians shop online the way they do, pointing out the importance for local and global e-commerces to provide Brazilian consumers with payment methods that they know and feel safe with. What you will be able to find on this survey? Which products/services they by the most online. Related content: What is a Boleto Bancário? EBANX is a Brazilian Fintech that offers over 100 Latin American local payment options to global businesses. The company provides solutions for global merchants such as AliExpress and Wish. 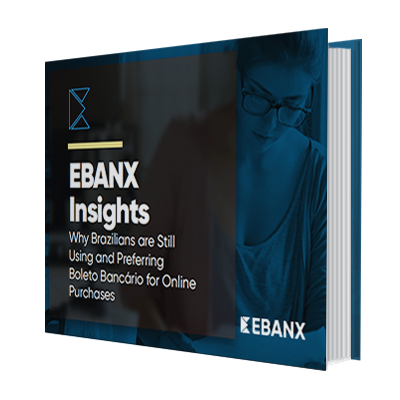 EBANX is changing the way consumers in Brazil, Mexico, Colombia, Chile, and Peru pay on international websites and has already enabled more than 22 million people in these countries to access global products and services, as well as enabling global e-commerces to reach new audiences.